“I have never seen a waterfall before” – Get Outside “Music in the Park” – Mt Field. 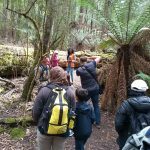 The Wildcare Get Outside Branch encourages people, newly arrived to Tasmania and from diverse communities, to learn, enjoy and spend time in our precious national parks. 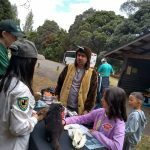 When inside the parks, volunteers from the Get Outside Branch share information about nature, conduct guided walks and other activities and openly demonstrate the leave no trace principles so everyone can learn how to care for and behave in our parks. 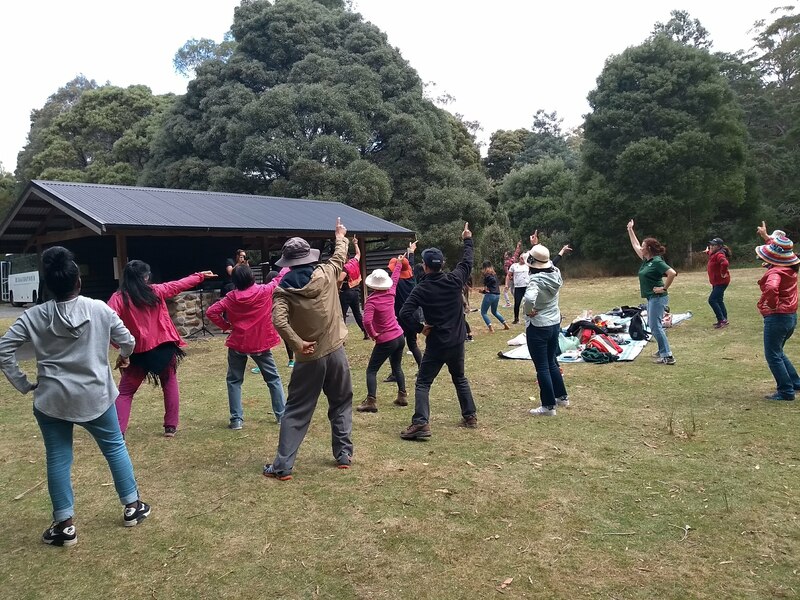 The “ Mt Field Music in the Park” event was made possible by a grant from the Bennelong Foundation and to great partnerships with the Tasmanian Parks and Wildlife Service and healthy Tasmania. 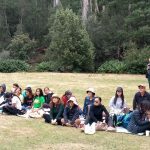 57 people from many countries including Sudan, Pakistan, Nepal, China, India and Australia were taken on three guided walks, shared a picnic lunch and were entertained and taught Bollywood dancing by a local dance troupe. 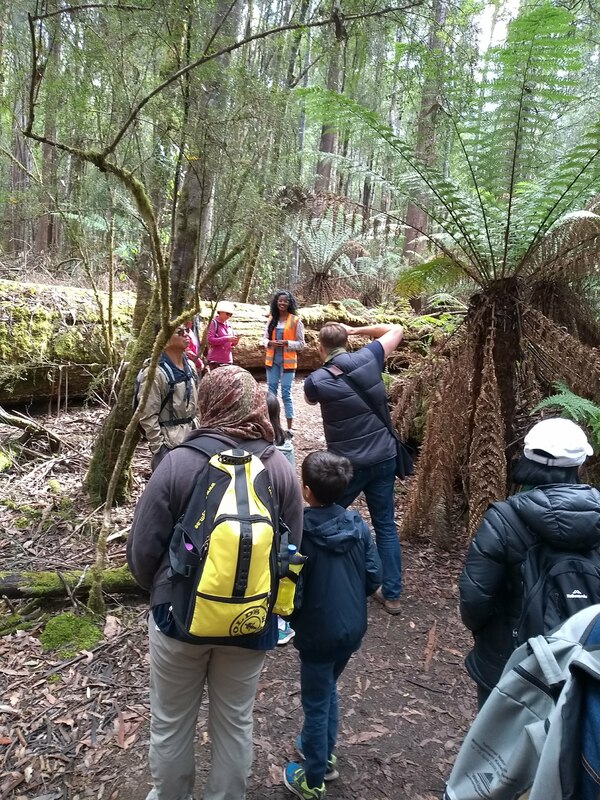 The group was divided into three and Get Outside Leaders guided them through the forest from the Tall Trees to Russell Falls. For some people it was the first time they had every seen a waterfall and Russell falls did not disappoint. The day was geared towards health and so movement, participation and dancing were high on the agenda. There were also quite moments of reflection and learning. One of the Get Outside Leaders said, “ I have never spoken to a Chinese person before and am often shy around them. Today because I was leading I had to be friendly and say hello. The woman I met was very friendly and funny. She was a good listener and I got to share with her about my culture”. 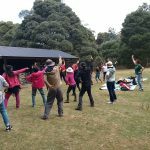 “ It is these sorts of interactions that make the Get Outside Program so valuable” said Jodie Epper, the program coordinator. “ It is much easier to meet and learn about new people and other cultures as you marvel at a tall tree together, “ she said. 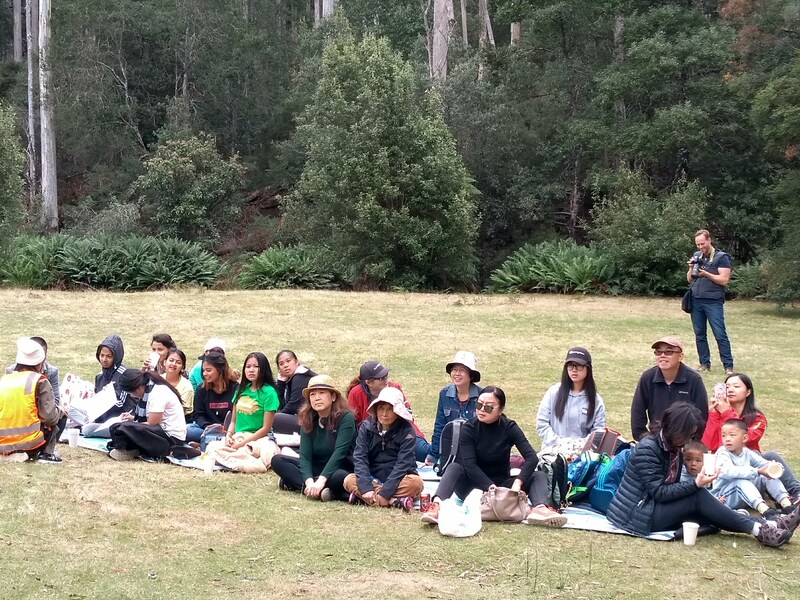 After the walks the participants shared a picnic lunch at the day use area next to the river. The PWS Discovery Ranger and the Junior Discovery Ranger facilitated a discovery table over the lunch break. 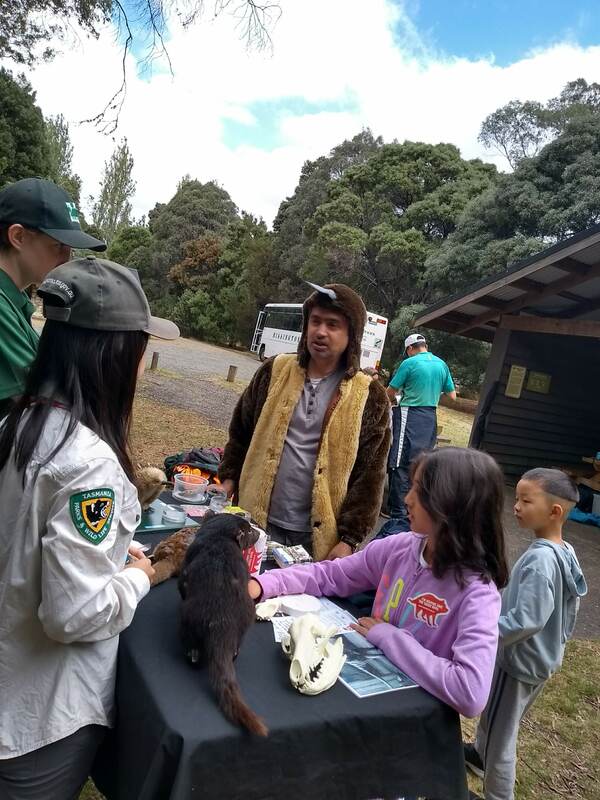 Many people came to touch the animals and find out about Tasmanian Wildlife – a great experience for many.